The first step to shedding the calluses and buildup coating your elbows is to become conscious of the bad habit that causes it. Think about it the skin over your elbows is responsible for protecting the joints, muscles and bones that allow your arm to move and flex. Over time, your skin will need to adapt to the pressure. You probably already know that thick skin accumulates in places that need extra protection from abrasion, like your heels and knees. (For a more extreme example, ask a dedicated guitar player about his or her callused fingertips. )Aside from occasional bumps and bruises, your elbows dont really need all that protection. If youre constantly leaning on them (which, if you have a desk job, could be hours every day), youre causing a lot of friction that results in dry buildup and tiny ingrown hairs, which can extend up the back of your upper arms along your tricep muscles. Some clothing, like wool sweaters, can make it even worse.Want to scrub off all the grime youve already accumulated from years of poor elbow posture? Well discuss cleansing tips on the next page. Why are the hardworking elbows such a common dry spot, Much like your knees, those little folds and creases are susceptible to dryness and general unattractiveness, but theyre important without that skin, your joints wouldnt have enough room to flex. Unfortunately, when your arms are straight, your elbow skin has no choice but to bunch up, and its easy for dust and germs to collect, which can be dangerous. Make sure you clean them often to prevent buildup and infection.You can take some simple steps to make your cleansing routine friendlier toward dry skin, and they wont even take any extra time. Shower at a moderate temperature, because super hot water saps moisture. Avoid skin care products containing alcohol and harsh acids, which can make dryness worse. Finally, resist the urge to scrub dry. If you gently towel yourself off, itll do far less damage to your skin.The shower is also a great place to exfoliate, or slough off buildup. On the next page, well tell you how to get the most out of your scrub. Exfoliation scrubbing off dead skin buildup to expose the fresh, new cells underneath feels luxurious, and its even better when you can use stuff you already have at home. For a yummysmelling combination that will seriously soften your skin, mix two parts brown sugar with one part olive oil, and add a bit of ground ginger. Gently massage into your elbows and wash off with a wet cloth [source: WebMD]. Regular exfoliation is a great treatment for keratosis pilaris, which is a harmless yet bothersome condition thats responsible for the chicken skin texture of your upper arms and elbows. (It can also appear in other places, like the thighs.) Keratin, a type of protein thats a building block for healthy skin, hair and nails, can build up in your pores, which plugs the hair follicles, causing bumps and ingrown hairs. Gently exfoliating in the shower helps soften the skin. Follow up with an overthecounter lotion that contains lactic acid, which helps reduce keratin buildup [source: Grossman].Youre not done yet, though. Keep reading to learn how to protect your fresh, newly smooth skin. Despite folds and creases galore, elbows are woefully lacking in the glands that keep the rest of your skin lubricated, so its up to you to pick up the slack. This is another endeavor where its easy to find helpful products at home. Milk is handy for a soothing soak. Thick moisturizing creams and petroleum jelly are the best products for a little postshower attention, and some experts recommend at least two applications a day.Other overthecounter options are lotions containing urea, lactic acid, or alpha or betahydroxy acids, which are good for fighting bumps. A very small amount of jojoba oil, massaged into dry elbows, will closely mimic the bodys own natural moisturizers [source: Shape].Whatever moisturizer you choose, experts believe the key is to slather it on as soon as possible after bathing, preferably within a couple minutes of toweling off. This will help prevent the moisture loss from evaporation that occurs when your skin starts to cool down.And it cant be said enough: Make sure youre hydrated to help keep your skin healthy. If youre spending a lot of time exercising or enjoying the sun, drink more than usual to compensate for the hydration youre losing through sweat.Unfortunately, you cant cure every skin malady in your kitchen. Some elbows might be so far gone that professional help is in order. Considering the commonness of dry elbows and all of the possible causes, it seems as if you could try home and overthecounter remedies forever. In certain cases, though, a trip to the pharmacy just wont cut it.The elbows are common prey for psoriasis, though many people incorrectly assume its just a case of dryness [source: Kolsky Hertzig]. Psoriasis is characterized most often by patches of raised red skin topped off with shiny scales, which can ooze, crust or bleed if theyre picked or irritated. Elbows are an especially painful area because bending and moving affected skin can further irritate the rash, and psoriasis sometimes causes joint pain (psoriatic arthritis) in affected areas [source: WebMD].Eczema is another condition that warrants a visit to your doctor, because the condition is manageable but not curable. Management requires an evaluation to determine the triggers to your particular situation and ways to alleviate or avoid those triggers. Eczema results in dry, thickened skin that doesnt go away on its own or respond to hydrocortisone cream. The skin patches can blister or develop crust [source: WebMD].See the next page for more advice and lots more information on skin care. Elbows are unwieldy, knobby and generally awkwardlooking, so as long as they do their job properly, we rarely think about them. Even those of us who spend considerable time and effort to groom and clean the rest of our skin can be guilty of overlooking this spot. Unfortunately, it doesnt take long for neglect and bad habits to give way to thick, uncomfortable buildup. Though some of that buildup is necessary for protection, theres no need to settle for elephantlike extremities. No matter how long youve been ignoring your elbows, there are steps you can take to soften your skin and rid yourself of those persistent scales and dark patches. Read on to find out how you can change your habits and what you can do in the meantime for a quick fix. In no time at all, youll have the right to bare arms. 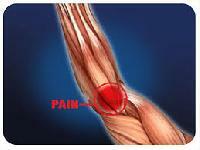 The most common cause of elbow pain I see on a daily basis is from overuse or repetitive motion from desk jobs. Over time, things like typing, reaching for something across your desk for a phone, or even regular bench pressing, or pushups can be deleterious to the health of your elbows. Eventually small tears can begin accumulating in the surrounding tendons, which may cause inflammation and pain. This can become significantly worse as the tendon repairs and scar tissue forms around the area creating a lack of blood flow. 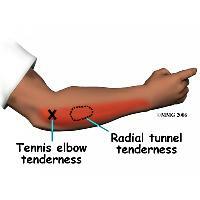 Elbow pain can come from the inner or outer part of your elbow, and in some cases the pain can radiate down your arm. Anything from a muscle strain, to tendon strain, tendonitis, bursitis, arthritis, a fracture, or dislocation can cause elbow pain. The most common forms of elbow pain from overuse, or repetitive motions are muscle, or tendon sprains.Most people will notice pain when twisting the forearm or wrist, especially while holding onto something heavy like a dumbbell. First and foremost, the best way to treat elbow pain is to find the source of the pain and eliminate it at least temporarily. If you continue to do what caused the pain in the first place it is safe to say that the pain will linger. 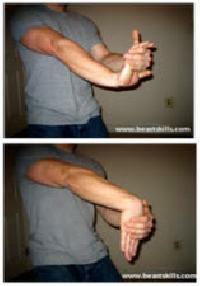 This goes along with 1 as it relates to the mobility of your upper extremities. If your elbows, wrists, and shoulders are tight you risk damaging the soft tissue around these joints .In conjunction with foam rolling and SMR, it is a good idea to stretch these areas after improving the quality of the tissue.One stretch I have become a huge fan of using with many of my clients is the elbow and wrist flexors stretch. You extend your elbow and wrist and gently use your opposite hand to pull them into greater extension.